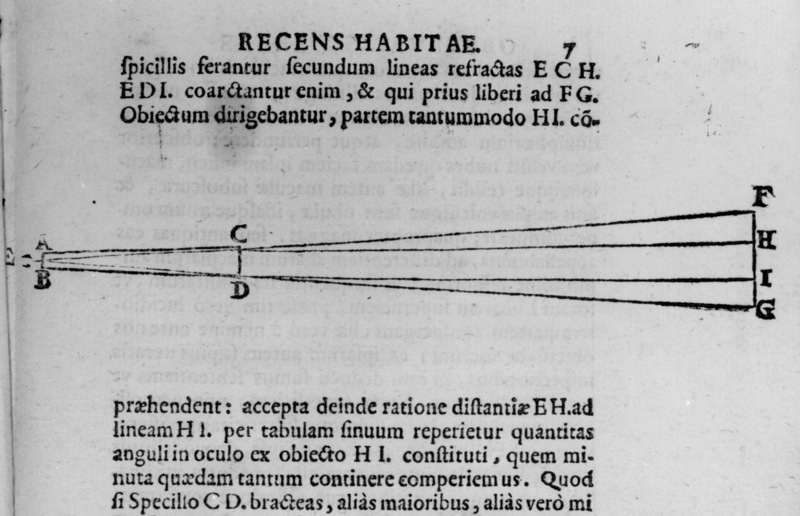 The diagram of the optical principles of the telescope from Sidereus Nuncius. The story of Galileo's telescope is well known, as he recounted it himself in the Starry Messenger. In July 1609, Galileo was in Venice, when he heard of an invention that allowed distant objects to be seen as distinctly as if they were nearby. In October 1608, a Flemish spectacle-maker by the name of Hans Lipperhey had already applied for a patent (which was refused), and news of the gadget was widespread in Europe by the time Galileo had heard of it. Around the same time, a foreigner turned up in Padua with the instrument; Galileo rushed back to Padua, only to learn that the foreigner had gone to Venice to sell his instrument. Galileo's friend, Paolo Sarpi, had advised the Venetian government against purchasing the instrument from the foreigner, since Galileo could at least match such an invention. By then, Galileo had worked out the principle of the telescope and returned to Venice himself with an eight-power telescope. The Venetian government doubled his salary, though Galileo felt that the original conditions were not honoured. Galileo gradually improved the power of his telescope, grinding lenses himself, and began observing the heavens. In the first two months of 1610, he was writing The Starry Messenger, and by 12 March, the book was already printed at Venice, dedicated to Cosimo de' Medici. 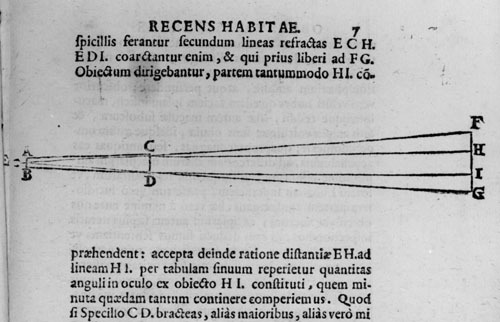 Galileo continued his observations with his telescope, some of which he conveyed in ciphers to Johannes Kepler, who had already responded enthusiastically with the Conversation with Galileo's Sidereal Messenger. Galileo's discovery of the 'handles' of Saturn was encoded in 'Smaismrmilmepoetaleumibunenugttaviras', which could be unscrambled as 'Altissimum planetam tergeminum observavi': I have observed the highest of the planets three-formed. Kepler deciphered this within one letter as 'Salve umbistineum geminatum Martia proles': 'Be greeted, double knob, children of Mars.' For the discovery of the phases of Venus, the code 'Haec immatura a me jam frustra leguntur oy' (this was already tried by me in vain too early) hid the message, 'Cynthiae figurae aemulatur mater amorum' (The mother of lovers [Venus] imitates the shapes of Cynthia [the moon]). Despite this exchange, Galileo never accepted Kepler's elliptical orbits. From 1616, Galileo tried to apply his knowledge of the satellites of Jupiter to the determination of longitude at sea. In order to ensure observation at sea, the Tuscan arsenal made for Galileo a headgear which had a telescope attached. Around this time, he also designed a brass 'Jovilabe', a computing device for prediction positions of the satellites. He hoped to gain support from the Spanish crown for this project, but failed.